What could be better than running a cake shop and small cafe in your own garden. Even more so when your garden backs onto a canal, and the wonderful canal boats that pass, make the view one that many would pay good money for. It felt like I was there. Fay seems to be living an idyllic life, with the cake shop in her garden. However, she is also trying to deal with her mother who has taken to her bed and the fact that her safe relationship with Anthony is not very exciting. Things are going to change for Fay and she is going to see everyone and life in a very different light. Opportunities present themselves and it is time to make some decisions. It seems that Fay’s idyllic life has some key factors missing. 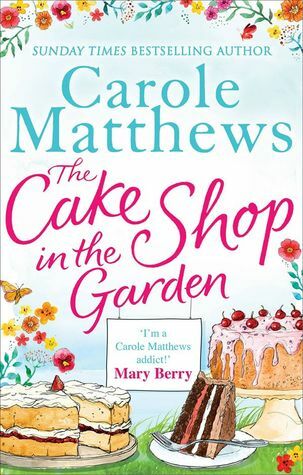 This is another wonderful read from Carole Matthews, an author I have only started reading within the last 12 months. Her characters bring out differing emotions in me, I wanted to shake Fay at times and get her to take a risk on a decision she was making, I felt like slapping Fay’s mother and boyfriend Anthony for being so needy and wet in equal measure. I would have all the time in the world for Stan, the daily customer to the Cake Shop in the Garden and no time at all for Edie who was the sister that we would all rather think was never related to us. And as for Danny, my heart beat that little bit faster. However, special mention must go to the forthright, spiky, full of passion character Lija who said everything we (and Fay) were thinking and had me ;laughing out loud with the way she dealt with life. We all need to be a bit like Lija. A lovely summer read, to while away some time in the garden with tea and cake! Thank you to the publisher and netgalley for allowing me to read this book. This was just the book I needed to read whilst on holiday from work, which is why I flew through it. I do love a nice comfortable read which actually packs a lot into the pages and the plot. I can see I need to read more of Carole Matthews in the future. I’ve yet to read anything by Carole Matthews but I love the idea of this one, so maybe I should start with it.